A Grand Tour Walk through Rome | Where's my backpack? 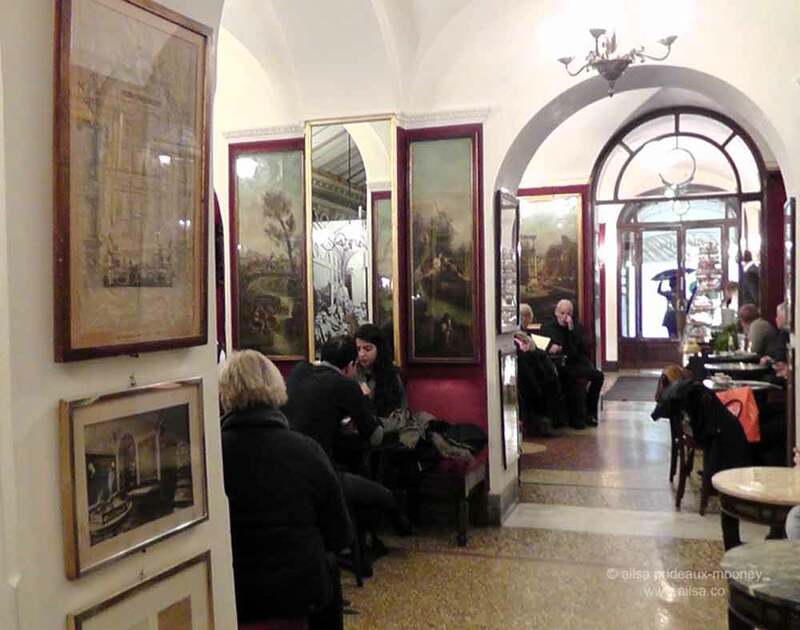 When Roman skies turn gloomy and rain starts to fall, there is no greater joy than to escape into one of Rome‘s many delectable coffee shops. You won’t have to look far to find one; they are everywhere, just follow your nose. And so it was when I was walking along the Via dei Condotti that a sudden cloudburst caused pedestrians to scatter like bowling pins and I found myself by chance across the street from a cafe with yellowed light spilling alluringly out its windows. 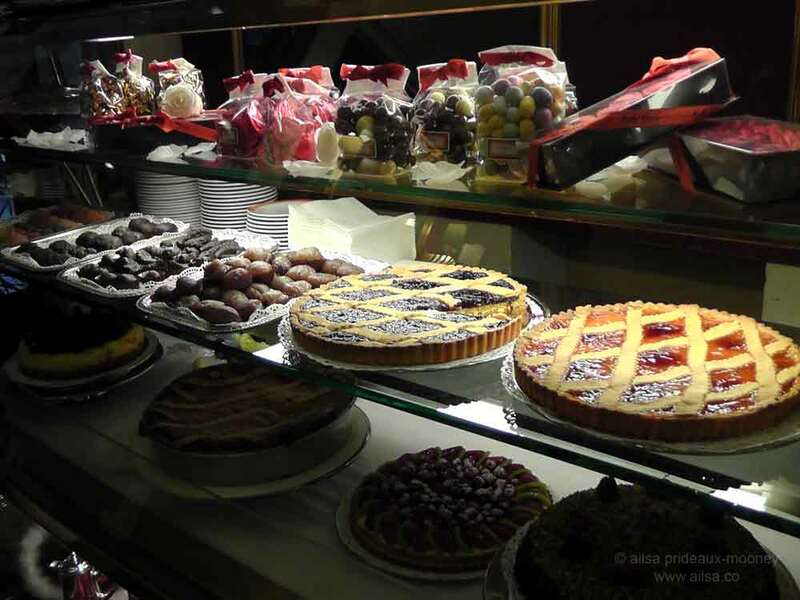 Inside, dimly lit counters were filled with delicacies, tarts and handmade chocolates vying for counter space. I ordered a coffee and, as an afterthought, a single marron glacé because those gently glazed chestnuts looked so perfect all lined up like little soldiers, glowing a soft caramel colour in the cafe’s yellow light. Before selecting a place to sit, I wandered the length of the cafe perusing the many artworks that adorn the walls. 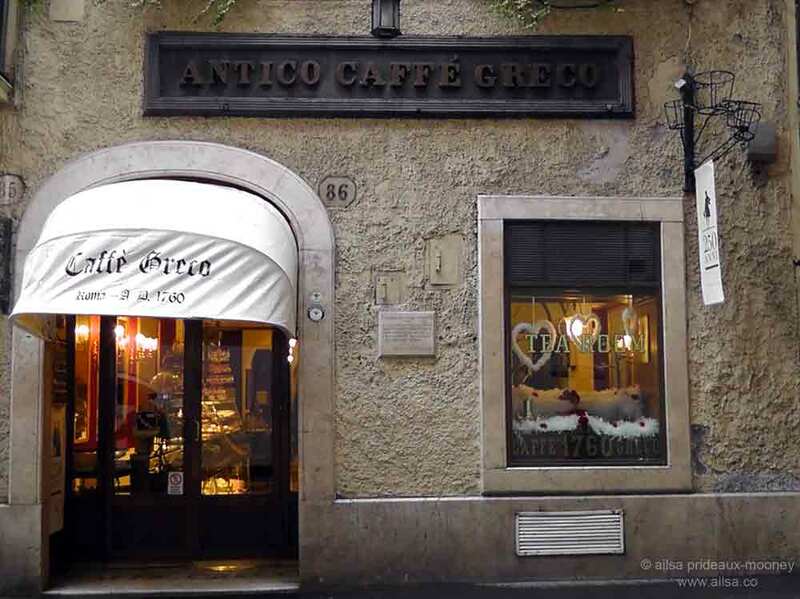 The Caffè Greco first opened its doors in 1760 and quickly became a popular meeting place for artists, writers, poets, politicians and other notables. 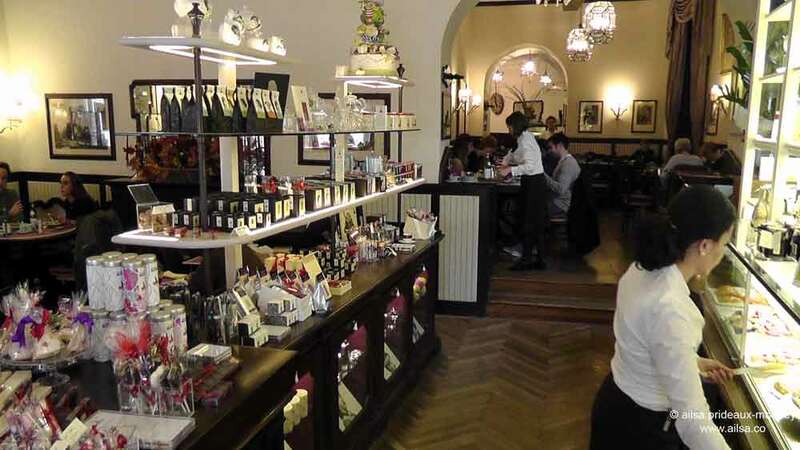 Goethe, Byron, Keats, Shelley, Wagner, Bizet, Mark Twain and even Princess Di have frequented this cafe over the years. The walls are covered with photos of prominent people from history enjoying a beverage at one of the cafe’s tables. 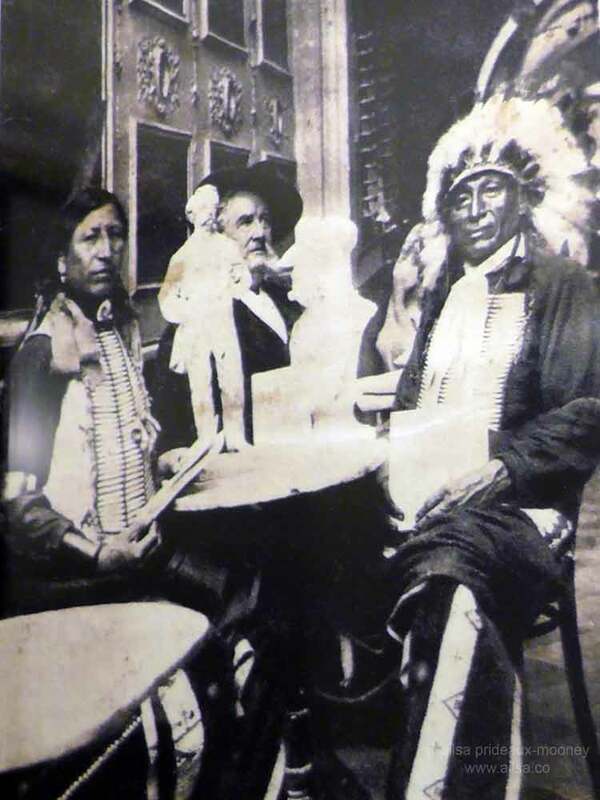 I sat down across from Buffalo Bill and had coffee with him and his entourage. Casanova had at least one rather risqué encounter here as a youth which he wrote about in his memoirs. I hoped I wasn’t sitting on the seat where he had made his conquest. The rain had abated somewhat by the time I had finished my coffee so I set off once more, now in a literary mindset. The Spanish Steps glistened with rainfall and rose men worked the crowds with armloads of blooms. To the right of the steps, a tall, thin house bore a placard commemorating a familiar name. 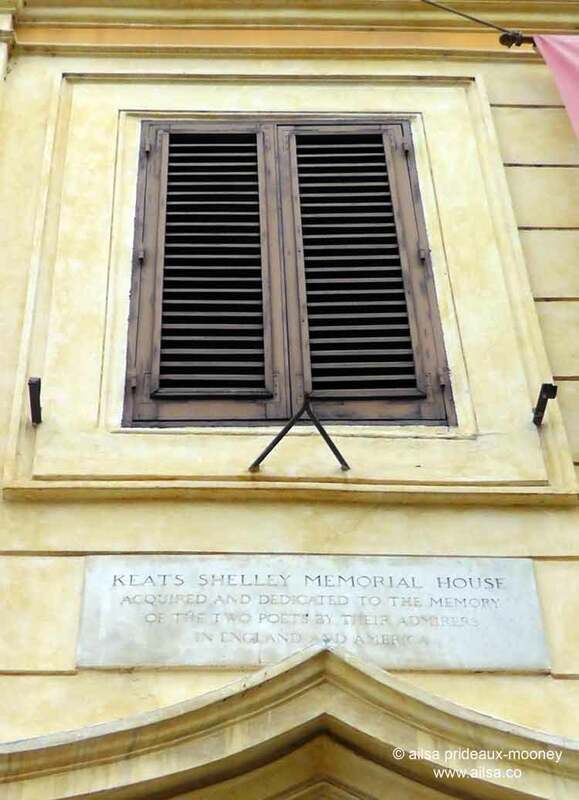 The building now houses the Keats-Shelley House; a museum celebrating the English Romantic poets who fell under the spell of the Eternal City. It contains a series of beautiful rooms and a wealth of books and curiosities from the lives of the poets. In the hallway hangs a beautiful hand drawn map of this little corner of Rome, the Tridente district, indicating the residences of its more famous inhabitants during the 18th and 19th centuries. Rome was an integral part of the Grand Tour. In the words of the great Robert Browning, ‘everyone soon or late comes round by Rome’. 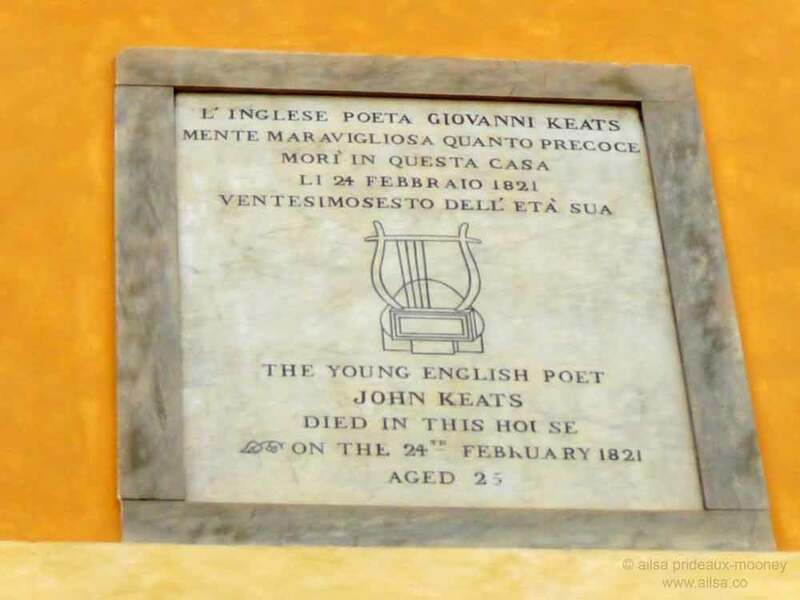 Poor John Keats, however, did not get to enjoy much of the romance and adventure of the Eternal City. He was already sick with tuberculosis before he arrived; in fact it was at his doctor’s advice that he made the trip in the first place. After a long and arduous sea journey, he arrived in November 1820 and set up house here right by the Spanish Steps. He wheezed his last tuberculosis-ridden cough the following February at the age of 25. Shelley, a friend of Keats, was at the time living in Pisa with his family. He had invited Keats to stay with them when he had heard of his friend’s illness, but this never came to pass. Upon hearing of Keats’ death, Shelley wrote the pastoral elegy Adonais, which he held to be the greatest of his creations, mourning his friend’s passing. The following year, Shelley’s life was also cut short when his boat was caught in a sudden storm and he was drowned. 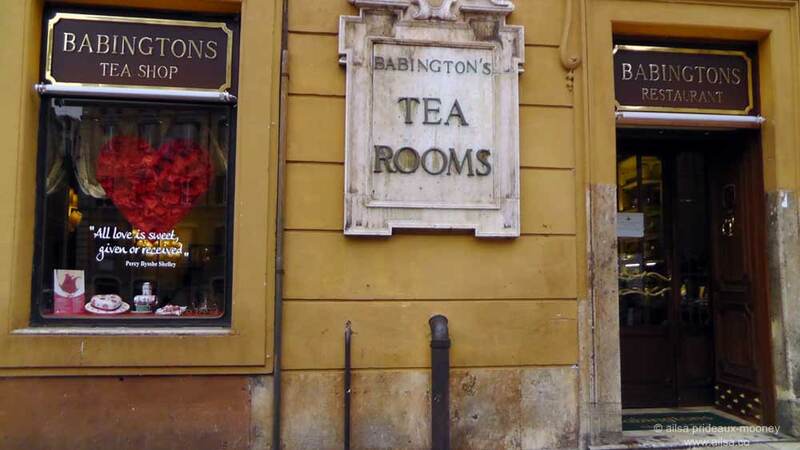 On the other side of the Spanish Steps is a rather illustrious tea house, Babington’s, founded in 1893 by two English women. At the time, tea could only be bought in pharmacies in Italy, so Babington’s provided a much-needed cuppa for the droves of English who now visited and often set up residence in Rome. The 19th century interior is beautiful in a bright and shiny kind of way. In complete contrast to the cozy intrigue of moodily-lit nooks and crannies in the Antico Caffè Greco, Babbington’s dazzles with glamour, lit with sparkling crystal lamps and offering wide open rooms filled with tables. It too has had its share of illustrious visitors. During the filming of Cleopatra it was a favourite hangout for Richard Burton and Elizabeth Taylor, and Fellini couldn’t resist their English muffins. 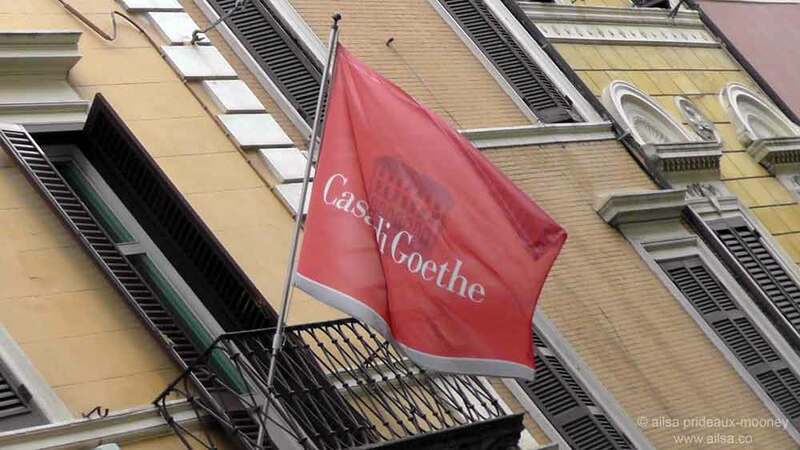 I pushed further on, down winding streets past the Casa di Goethe where the German author once had his residence. It now houses a museum dedicated to his works but it was closed on Mondays so I kept going. My walk took me along a small side street that runs parallel to the Via Babuino which I wrote about earlier in the Congregation of Wits. The side street is called Via Margutta and was THE place to live if you were an artist in the city. Its reputation as the Artist’s Street began as far back as the 16th century when it was declared a tax-free zone for artists. If you were a resident of the Via Margutta and an artist, you would be exempt from any and all taxes, so naturally, artists and musicians flocked here from all over Europe. Debussy, Picasso and Stravinsky, Liszt and Wagner all lived and worked here. In the 1950s Gregory Peck and Audrey Hepburn’s ‘Roman Holiday’ shone a spotlight on this street as well as the Mouth of Truth. Truman Capote lived at number 33 in the 60s and Federico Fellini was just down the road at number 110. Even though it is so central, you could easily forget you were in the middle of a bustling metropolis as you walk down this ancient cobbled street lined with brightly painted ivy-clad houses, filled with galleries and antiques shops. 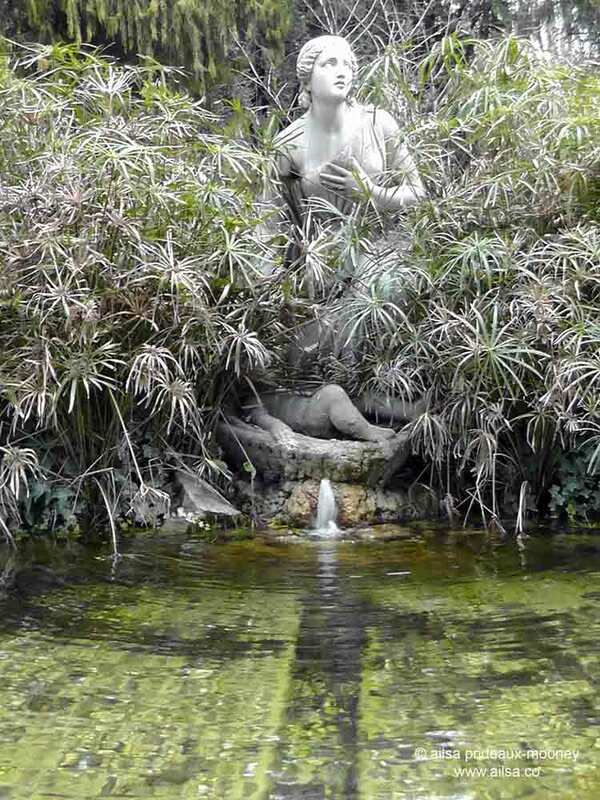 The weather was still holding out so I decided to venture a little further to finish my walk through Rome’s artistic yesteryears in the Pincio Gardens. 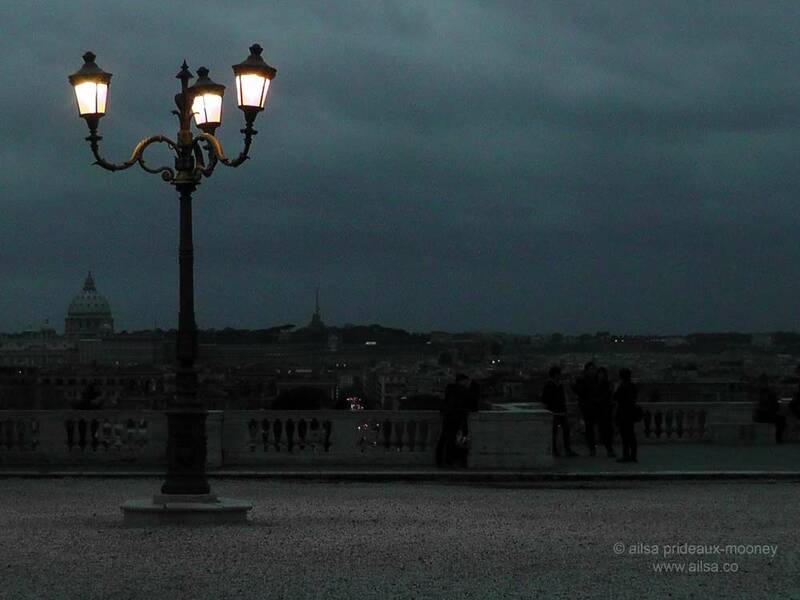 I climbed the steps from the Piazza del Popolo as the sun started to drop low in the sky. It is impossible to walk along the formal pathways without feeling the whisper of Henry James, Edith Wharton, F. Scott and Zelda Fitzgerald. The pathways are lined with marble busts of famous Italians of yore. Many of the busts’ noses have been smashed and repaired over the years, due to an ancient belief that the nose, where you draw breath, was the source of life, even after death. It stood to reason that if you removed the nose of the statue, the spirit would be deprived of oxygen and could haunt you no more. The sun dropped below the horizon as I made my way to the Pincio terrace with a view that stretches over the city to the Vatican. It was the perfect way to end the day in the company of literary giants of a bygone era. This entry was posted in Europe, Italy, Photography, Travel and tagged history, inspiration, italy, photography, photos, pictures, travel, writing. Bookmark the permalink. A beautiful walk Ailsa and I appreciated learning about the history. Your line about pedestrians scattering like bowling pins had me giggling at the vision. We are headed to Italy this fall but only a couple of days in Rome. Just enough to touch the surface this time. Beautiful City and luvd the history. Beautifully written! Loved reading the anecdotes from history. Your writing makes me want to visit Rome right now and trace all these places that you mention. Wow, loved this Ailsa! Rome is my favorite city. Still haven’t been to Rome but these tea and coffee shops make it even more tempting. 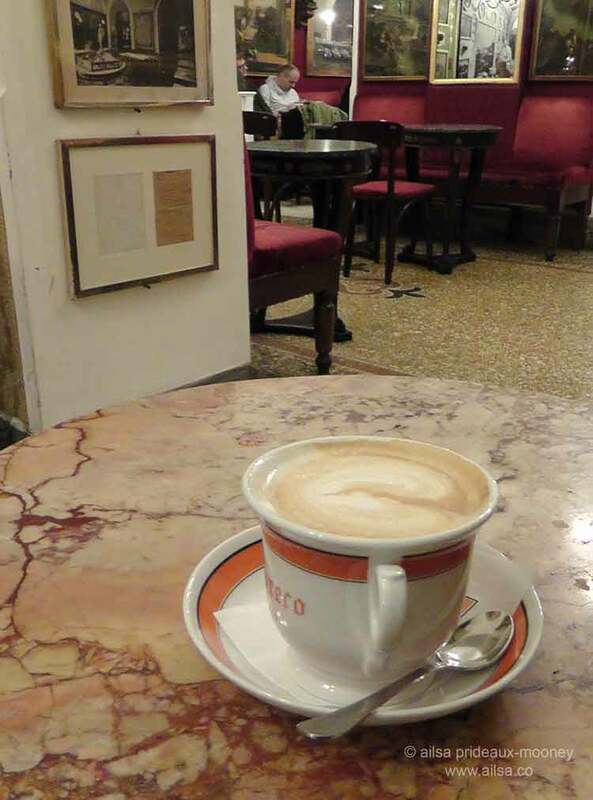 I fell in love with the Caffè Greco, Gilly, it is steeped in history and has everything I could ever want in a coffee shop with all those nooks and crannies where you can while away the hours, sipping coffee and writing to your heart’s content. thank you for a wonderful tour. I hope to visit some day. I finally got a chance to visit Rome last fall and it really is a city of hidden treasures down every street and around every corner. I was totally smitten by this spectacular city – thank you for the fantastic tour so I could relive some great memories. What a wonderful little journey 🙂 Love the way you bring your words alive in your writing! There was so much history I didn’t know of, fascinating! Now I wanr to visit the city even more! I fell head over heels in love with Rome! Unfortunately I was on crutches and had a moon boot on, walking was very difficult, so I missed out hugely on the sights. But I threw my coins into the Trevi Fountain, and hope to go back soon. Oh Dio! I ve been to Rome to the same places and I loved it! It was a sunny hot summer and the experience was magnificent! I ‘ve written on my blog about it! Have a nice weekend! After reading your piece about the Caffe Greco I went to a cold cold cafe where there was no art on the walls, no history, and felt disappointed with my cafe life. I need to take my own grand tour. Wonderful description of some particular place of Rome ! A great tour Ailsa filled with interesting tidbits. Thanks for the lovely visual tour Ailsa – it’s cram packed with interesting bits to savour and great pics. Wonderful post! 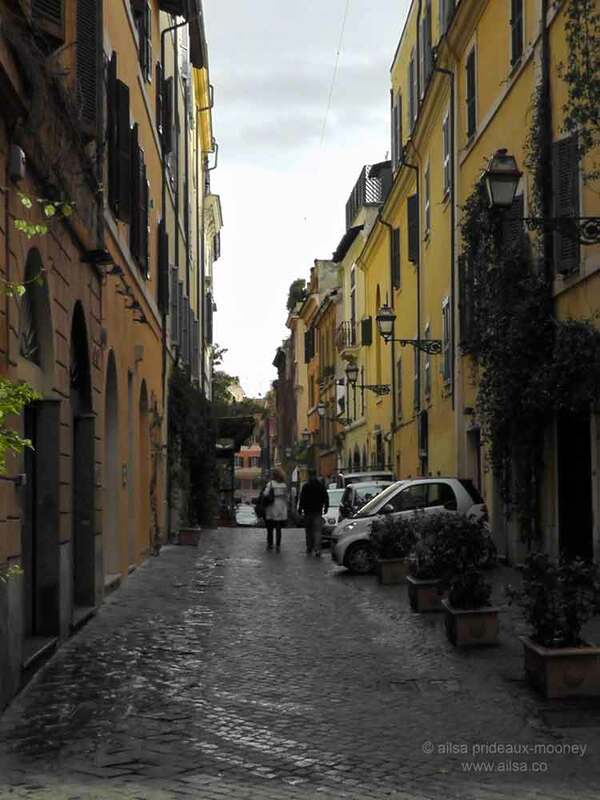 I love Rome and looking through your eyes, I can always discover new things and stories of the city!